I am a saltwater snob when it comes to fishing. I was born on the ocean and may well die there, although hopefully not too soon. For me, freshwater fishing has always lacked the adventure, the thrill — and the reward — that its oceanic cousin brings. And while I can get into fishing lakes and rivers when I am in the right mood, I’ve always found freshwater fish to be rather bland at the table. Yellow perch are the exception. I love everything about yellow perch, from the catching to the eating. They are simple to catch, aggressive biters and you can often catch them in large number. In the kitchen, they are indeed mild like most other freshwater fish, but the meat is snowy white and every bit as firm as that of a grouper or tautog. And if you’ve never heard of a tautog, it is the finest chowder fish in North America. More on chowder later. I don’t get to fish for perch very often, they are not native to the West. But I’ve been on the road lately, and one of my stops was in eastern Ohio, near Cleveland. This is where my friends Joe and Dorrie live, and I’ve been telling them for more than a year that I’ve been wanting catch yellow perch in Lake Erie. Why Lake Erie? More than 85 percent of the continent’s commercial catch of yellow perch comes from there, and I’d heard stories of recreational anglers having hundred-fish days, and of perch topping two pounds — a monster for a fish that averages about 5 ounces. I had to get me some of that. Yeah, I hear you. Isn’t Lake Erie horrifically polluted? Isn’t it near the Cuyahoga River, which famously caught fire in 1969? That was a long time ago. For those of you who haven’t heard, the lake has cleared up dramatically since the 1990s, thanks to serious anti-pollution laws, and, oddly, the invasive zebra mussel, which filtered out even more pollution from the lake. This helped the mayfly larvae that the perch love to eat return in force. Another invasive species, the round goby (a little fish) also arrived in recent years, and has quickly become another favorite food of the yellow perch. As a result, perch numbers have increased almost every year since they crashed in 1994. This is the science behind all the stories I’d been hearing. As we were driving to the lake, Joe added to the tales. “Oh, we should get our limit in a couple hours,” he boasted. A limit in Lake Erie is 30 fish, an amazing number in my book. I was skeptical, and I told him so. Still, I headed out onto the lake with an angler’s hopes nonetheless. It was a gorgeous day with just the right breeze. I wasn’t thinking about a limit, but surely we’d each catch 10 perch or so. Yep. That’s Cleveland. And if you look closely on the right, you can see the stadium where the Cleveland Browns play: The Factory of Sadness, or if you prefer, the Cauldron of Despair. Or maybe the Pit of Angst. Sorry, Cleveland. Someday your time will come. Gotta say it was a ton of fun to fish urban waters. There’s something about fishing while watching other people work that is perversely satisfying. It’s even more fun to know that it was safe to eat the fish there. We’ve come a long way from the 1970s. You fish for yellow perch with live emerald shiner minnows, hooked through the back on either a high-low rig or a spreader; you want two hooks in the water, as, allegedly, the action can be fast. Joe and I dropped our lines to the bottom, about 30 feet below. Sure enough, we soon felt the tug of a perch. 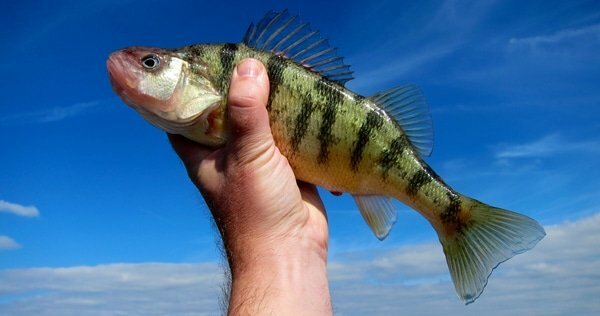 If you’ve never caught a yellow perch, they are not the fightin’est fish in the water, but they’re better than a walleye or codfish, which kinda just lay there. I pulled my fish up and it was a nice one, close to a pound. Joe began catching them, too, and soon we had 10 perch on ice. And then it stopped. I knew it. Joe had offended the Fish Gods, and they were punishing his hubris. I was collateral damage. “I told you, Joe. You shoulda kept your mouth shut.” Joe mumbled something about this never happening, something about weather and cold fronts and voodoo or somesuch. Must be a Cleveland thing. All I knew is that the legendary 100-fish day would not happen. But even still, we picked away at the fish. Joe kept lamenting about how crappy the fishing was, but slowly we began amassing enough for a feast. I could only imagine the carnage of a good day. In the end, we caught probably 35 perch and kept about 15 big ones. Definitely enough for a meal or two. That first night I really wanted to make a perch risotto, as we had the fresh bones and heads from the filleted fish. If you’ve never eaten a proper fish risotto, you need to: It is a tradition of Venice, and, done right, is ethereal. I’ll post that recipe soon. We had more perch than we needed that night, so on the way home it struck me: Cleveland has one of the most vibrant Polish communities in America. And perch makes a phenomenal chowder. Cleveland style, Polish perch chowder was born. It took me until yesterday to make the recipe that I had rolling around in my head for more than a week. What makes a chowder Polish? And what makes a chowder a chowder, for that matter? Well, for me a chowder must have potatoes and onions and something seafood-y, i.e., clams, fish or some other seafood. And it must have a dairy product. 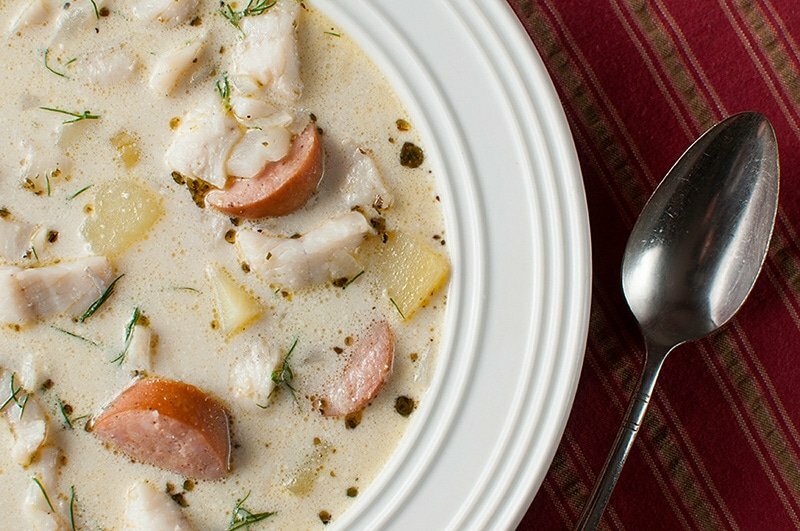 I love fish stews and soups more than the next guy, but if it ain’t white it ain’t a chowdah. So a chowder of perch, butter, potatoes, onions and fish stock was where I started. And the Polish? Easy. I decided to toss in a link of Polish kielbasa, a pinch of marjoram and dill, and for the dairy I skipped the regular cream and went with sour cream. How was it? Lemme tell ya, if the Browns ate this they might win more games. 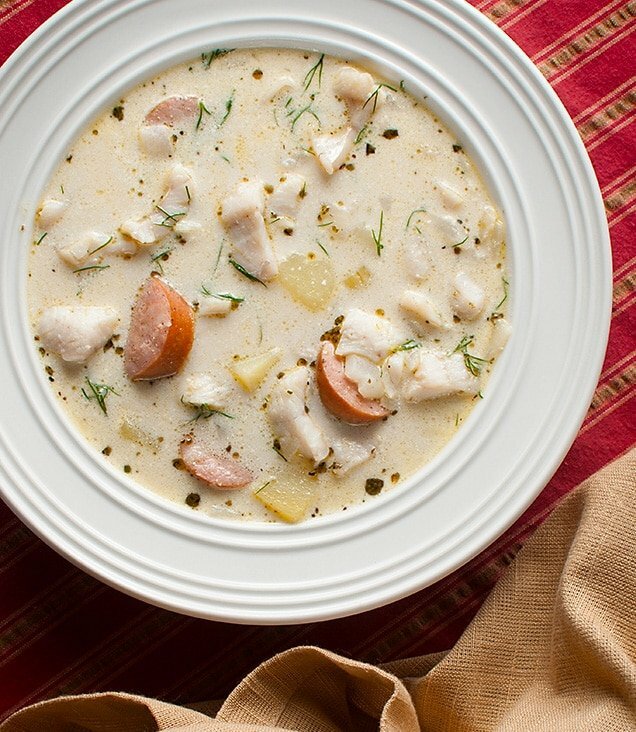 This is a pretty standard fish chowder with some Polish flair tossed in. I of course used Lake Erie yellow perch, but any firm fish will do. 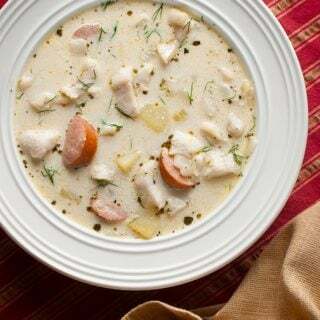 Use a good chowder fish like perch, tautog, tilefish, sturgeon, cobia, California white seabass, grouper -- the key is firm and white. Most good Polish kielbasa sausage is smoked, and while you can use whatever sausage you want, make sure it is smoked. You want that flavor with the mild fish. The dill really adds something to the stew, but if you hate it, use parsley instead. As for the sour cream, put it in a bowl at the table and let people add it to their liking. Melt the butter in a Dutch oven or other heavy pot over medium heat. When it stops frothing, add the chopped onion and cook gently until its soft and translucent. Do not let it brown. Add the potatoes and coat with the butter. Cook for 1 to 2 minutes to let the butter absorb a bit. Sprinkle everything with salt. Pour in the fish stock, water and marjoram and add salt and pepper to taste. Simmer gently for about 20 minutes, or until the potatoes are tender. Once the potatoes are tender, add the perch and the kielbasa and simmer another 10 minutes. Turn off the heat and add the dill. Ladle into bowls and let everyone add sour cream to taste at the table. Serve with lots of beer. and some crusty bread. If you are looking for a chowder that works well with Great Lakes salmon and lake trout, try my Salmon Chowder. I haven’t had yellow perch since my parents sold our cottage. Most we would ever do to them was panfry them. Once we ran out of flour for coating, and ended up using pancake batter mix. That was awesome actually. I just picked up some Great Lakes Whitefish at the market today, which is apparently also from Lake Erie (I had no idea that there was a Whitefish fishery in Erie, I thought commercially it came out of Huron, Superior and Lake Winnipeg.) which I’m going to make this soup with. My husband’s Polish, and he is quite enthused about trying this recipe. Also, it will majorly cut into a growing supply of potatoes from our winter CSA. My boys just caught some Perch ice fishing…..looks like they will be having some “Chowda” tonight! I might add some half/half to the broth! To Steve in Canton and anyone else considering ceviche- I would caution against eating raw perch or most any freshwater fish for that matter. If you do, just make sure you freeze it to sushi grade temps for a long time, as perch are somewhat notorious for having various parasites that you probably don’t want in your gut. That said, perch are awesome and I love to eat them in all forms…. I found this recipe way before discovering Hank’s cookbooks, and it has been my go-to recipe for cooking up perch during the cold winter months. As with many of Hank’s recipes, you can’t go wrong with this one. It’s a very tasty and filling chowder.